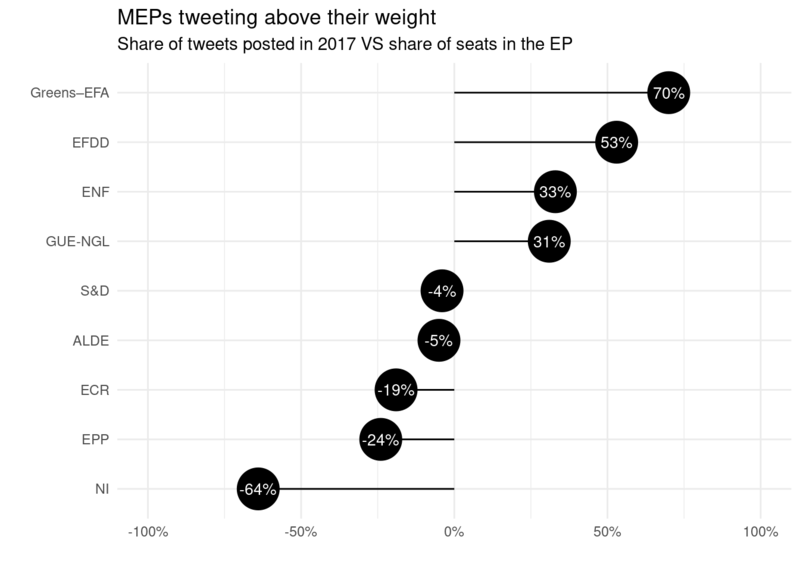 As a result of the fact that Twitter allows to retrieve systematically only the latest 3,200 tweet for each user, as highlighted in a previous post, the shape of the graph reflects not only the increasing number of MEPs on Twitter, but also this limitation: the further back in time, the less tweets are available. As a consequence, analysis on earlier years are structurally incomplete. In order to include in our analysis also more prolific MEPs on Twitter, the following sections focus only on tweets posted in 2017. For the given period, our dataset includes data for all but a few months of the most hyper-active MEPs on the social network (regular data gathering started in October 2017 allowed to collect about 1.5 million tweets by current MEPs). Is the number of tweets posted by MEPs proportional to their share of seats in the European Parliament? If this was the case, the following lollipop graph would have all groups standing at 0%. 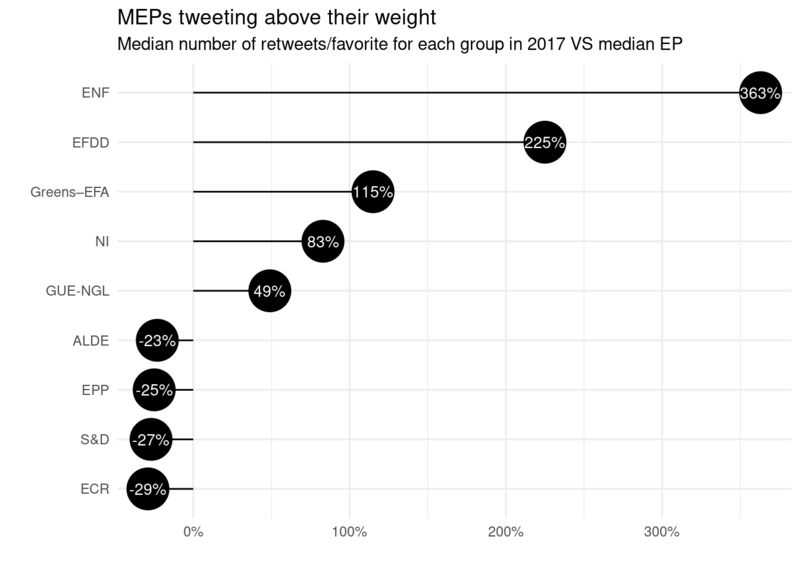 As it turns out, this is not the case: smaller, non-centrist groups tend to have MEPs who are more active on Twitter: members of the two groups associated with Green/lefitst politics and the EFDD (mostly composed of representatives of pro-Brexit UKIP and Italy’s Five star movement) tweet more frequently than their peers in the larger EP groups, such as the European Socialists and in particular the People’s party. For reference, here’s a table with the full name and the relative abbreviation of all groups in the European Parliament. Excluding retweets from the calculation presents similar trends, but further accentuates the results. In particular, it appears that EFDD members tweet almost twice as much as their average peers. Excluding retweets also highlights the frequency of original posts by largely anti-EU ENF members. However, the number of interactions driven by these tweets are arguably a more important metric than the bare number of tweets. 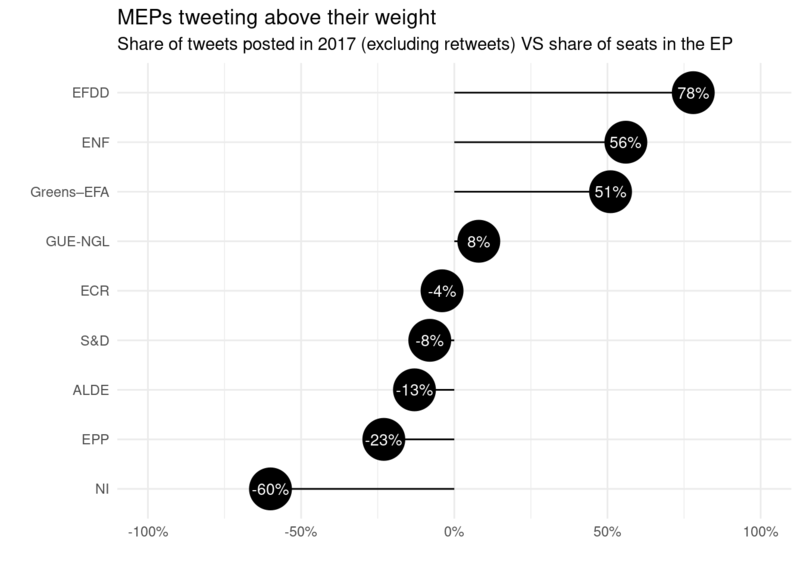 So, which MEP do tweet above their weight? The answer is quite clear: tweets by MEP belonging to largely eurosceptic EFDD and ENF attract by far more interactions than all others. 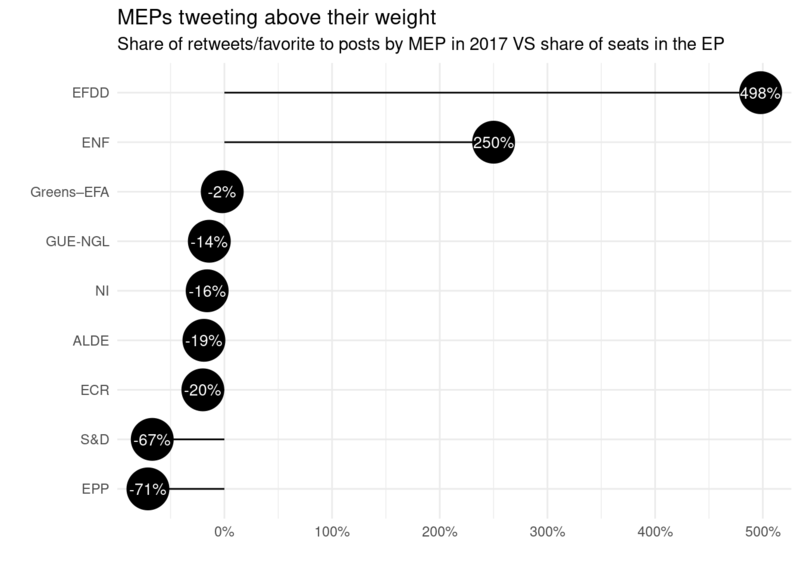 To clarify the meaning of the above graph: if each MEP got exactly the same number of retweets and favorites in 2017 (no matter how much they tweeted), all groups would be at 0%. In other words, tweets by EFDD members attract five times more interactions than the average MEP. Tweets by the largest EP groups (EPP and S&D) attract far less interactions. These results seem to be largely driven by a small group of MEPs who, by number of interactions, tower above all others. In the case of at least some of them, their popularity can hardly be ascribed to their activity in Brussels and Strasbourg. Last year, tweets by Nigel Farage have been retweeted or liked more than 5 million times; Matteo Salvini’s almost two million times. Very big numbers are known to lead to misleading averages. Calculating the median, rather than the average, may lead to more meaningful results, as it would minimise the impact of individual Twitter super-stars. The numbers are less extreme, but the trend remains noticeable: MEPs who are in the ENF and EFDD tend to attract more interactions than their peers in all other groups, most noticeably those belonging to the largest groups in the European Parliament such as the EPP and the S&D. The following graph allows you to explore the number of followers of each MEP, and the number of interactions (retweets and favourite received) in 2017. For clarity, the same graph is presented below at a closer level of zoom (MEPs with less than 100,000 followers and interactions).